This is a very rare large Egyptian Revival pendant made in England circa 1870. 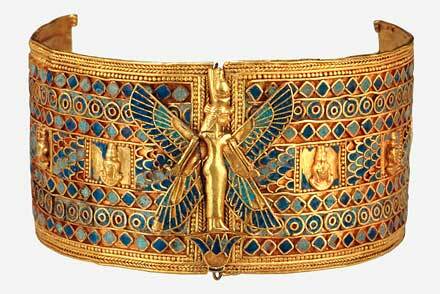 The 18-carat gold mounting is decorated with enamel with an Egyptian style color palette of red, white and blue. An ancient so-called heart scarab is embedded in the mount. This amulet (4.3 x 3.3 cm.) of turquoise glazed faience represents a scarab. It dates from the Ptolemaic or Roman period (1st BC – 1st AC). This scarab is an authentic Egyptian artifact, brought back from Egypt. To the ancient Egyptians the scarab or dung beetle was the symbol of resurrection and eternal life. The fact that it uses its hind legs to roll a piece of dung backwards into its nest made Egyptians believe the insect had the same power as the god Ra. Why? Because Ra moved the sun in the same way. Since the sun keeps rising every day and eternally, the scarab is as holy as Ra. Scarabs were often given to the deceased to ensure life after death. (Since the amulet is not inscribed with a prayer or a name, it is not likely that this scarab was buried with a person of importance. Its charm is no less strong because of that.) Originally this type of heart scarab was sewed to the breast of a mummy accompanied by two wings to assist the journey to the afterlife. On the back of this amulet there is even still a small trace of the mummy wrapping visible. The symbol of the scarab was used for many purposes including inscribing prayers, making official seals and commemorating special events. 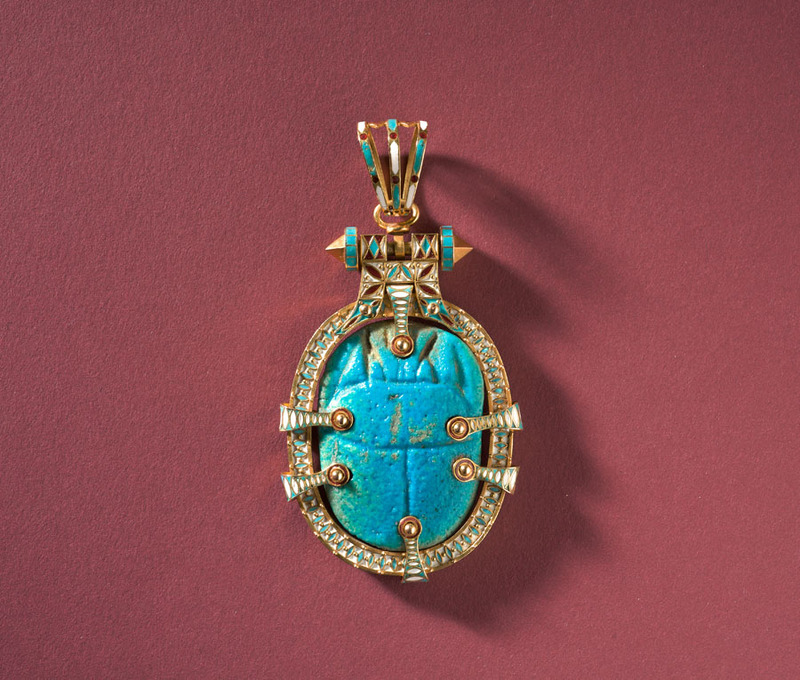 Some scarab amulets were also worn in daily life as a ‘regular’ protection against evil. Many discoveries of great cultures have lead to a revival of interest in their art and jewellery. Among these have been Roman, Greek and Celtic revivals. The discovery of the tombs of the Egyptian pharaohs and the objects with which they were buried and were presumed to take with them to the afterlife, have inspired many works of art. Napoleon had already been greatly inspired by Egypt at the time of his Egyptian expeditions in 1798, as is reflected in early 19th-century French art and architecture in the form of Egyptian ornamentation, such as scarabs, sphinxes, winged lions and lotuses. 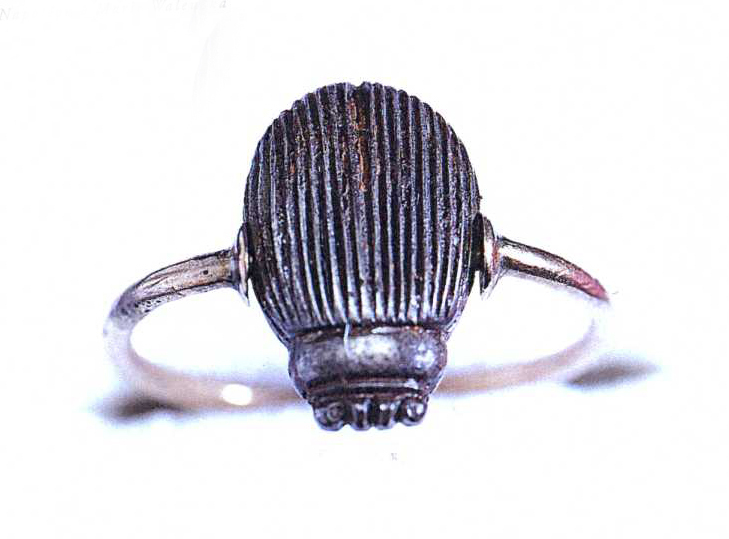 Napoleon was superstitious and supposedly wore a simple Egyptian scarab as a talisman on his finger. So as not to be lonely in the afterlife, the story goes that he also gave one to his mistress, Marie Walewska. There were many Egyptian highlights in the mid-19th century. The Rosetta stone helped Jean Francois Champillon decipher the Egyptian hieroglyphs – all traditional art and jewelry at that time was decorated with hieroglyphs. In 1859 the archeologist Auguste Mariette discovered Queen Ahhotep’s grave (from 1550 BC) and her jewels were shown at the 1862 World Exhibition in London, where they caught the attention of the Prince of Wales. Having just returned from a Grand Tour in Egypt, the Prince gave Princess Alexandra of Denmark a very special wedding gift in 1863: an Egyptian-style necklace set with scarabs made by the jeweler Robert Phillips. It was not until after the discovery of Ahhotep’s tomb and the creation of the Suez Canal in 1867 that Egyptomania spread like wildfire throughout Europe. This pendant combines an ancient artifact with a modern (Victorian) setting, yielding an astonishing synthesis in the field of Egyptian art. Ancient traditions always seem to inspire contemporary developments. 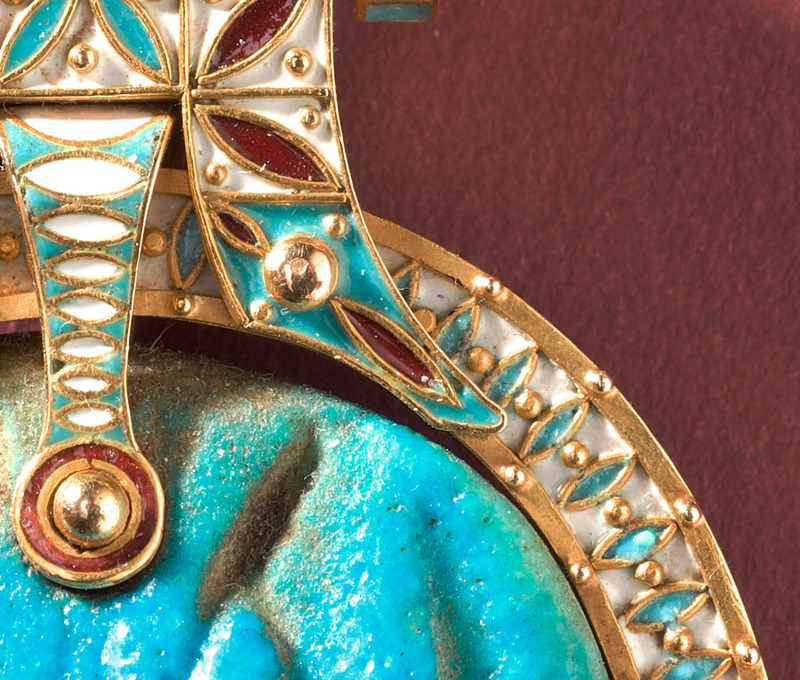 The technique used in this Revival pendant can be compared with that of one of the first spectacular Egyptian jewellery finds; the Nubian bracelet of Queen Amanishaketo at Meroe, Sudan (then South Egypt), discovered by Giuseppe Ferlini in 1834. In our pendant, as in other revivalist jewels, the colored glass inlays of ancient ones, have been replaced by enamel.